Lovelace was once merely a ship’s artificial intelligence. When she wakes up in an new body, following a total system shut-down and reboot, she has no memory of what came before. As Lovelace learns to negotiate the universe and discover who she is, she makes friends with Pepper, an excitable engineer, who’s determined to help her learn & grow. Chambers’ first book in the Wayfarer universe made my Top 5 books of 2015; The Long Way to a Small, Angry Planet was an engaging, diverse space-opera with nifty, distinct alien races and some truly fascinating worldbuilding, but I still had a few qualms with it. As much as I loved the story, I found the structure and pacing choppy and somewhat distracting: it almost felt like a 90s TV show, focusing on a new alien every chapter. This minor cloud has a major silver lining, in that having crammed so much worldbuilding into the first book gave Chambers a solid basis upon which to build this companion novel. 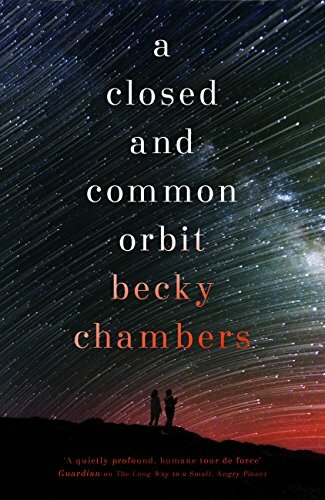 Without giving away the big plot twist at the end of The Long Way to a Small, Angry Planet, I can say A Closed and Common Orbit is a much more intimate book. Here, we focus on two main characters and a small supporting cast rather than an ensemble, which I thought was a lot more effective. Half of the narrative is set just after the events of The Long Way to a Small, Angry Planet, as we witness Sidra struggling to adjust to life in a body kit, while the other half focuses on Pepper’s childhood, more than a decade prior, when she was called Jane 23. In the establishing chapters of both storylines, I found myself wishing things would happen a bit faster, but I did enjoy both stories, and the way they came together at the end was very satisfying. This structure also allows Chambers to do some really interesting and effective storytelling. Early on, a full-grown Pepper ordered ‘the left side of the menu’ from her local takeaway. I definitely chuckled, because who doesn’t love a too-large portion of proper greasy takeaway when the mood is right for it? Yet as we read on and witness Jane’s struggle to feed herself, Pepper’s enthusiasm for every food ever takes on deeper meaning. This is a woman who almost starved to death as a child, an experience which affects her to this day. There’s just more time in this book to devote to Sidra & Pepper as characters and to tell the stories of their lives and their growth in depth and in detail. The overall stakes are smaller, in a sense. We’re not looking at the end of the world, or even a tricky mission with a big pay-off that turns sour. But we are looking at things that do mean the world for some of these characters – finding your identity, your own place in the world, your purpose, your family. I teared up a good few times and I absolutely adored the ending. Such a perfect, beautiful note to leave our characters on. Oh hai, if it isn’t the latest release from one of my favourite writers! I didn’t know quite what to expect from The Family Plot since I’m honestly not that well-versed in ghost stories, but I really enjoyed it. The characters are great, the stakes are believable, the ghosts are pretty darn creepy and the mystery behind their need for revenge is very gripping. Also, THAT ENDING! 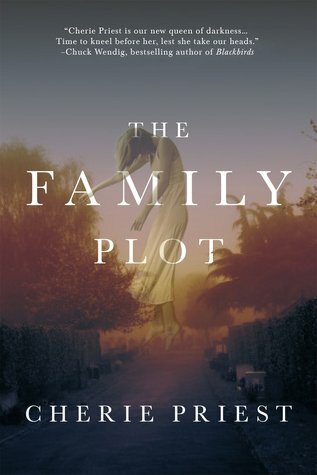 Check out my review video if you want to hear more of my thoughts on The Family Plot, and enter the giveaway below for a chance to win your own copy. The giveaway is open internationally until midnight on October 24th and the winner will be selected at random by Rafflecopter. The season of endings grows darker as civilization fades into the long cold night. Alabaster Tenring – madman, world-crusher, savior – has returned with a mission: to train his successor, Essun, and thus seal the fate of the Stillness forever. It continues with a lost daughter found by the enemy, with the obelisks and an ancient mystery converging on answers at last. This is quite a tricky book for me to rate and review because while it’s clearly very well written, I didn’t find it as enjoyable a read as The Fifth Season. I’m glad that I did read it because I’m still interested in the story and characters, but I found it a difficult read – very much worth the extra time and attention but still, not an easy reading experience. In my review of The Fifth Season, I mentioned that Essun’s point of view was my least favourite since it’s narrated in second person. Once again, the writing of the second person narration is impressively well-handled, as is the reveal that one of the characters is in fact the narrator. This was such a smooth transition that I couldn’t remember if it had been introduced in The Fifth Season, or if it was new information. And yet, I still found the second person point of view difficult to read. It still felt weird and occasionally jarring to me. The second point of view character introduced in this book is Essun’s daughter, Nassun, who is mentioned throughout the previous book, but who we haven’t yet properly met on the page. I enjoyed Nassun’s point of view a lot, and it was great to see her transform into a character in her own right, when she had been little more than a source of motivation for her mother in The Fitfh Season. It’s fascinating to get Nassun’s take on things, which is so different from her mother’s. Seeing this child’s interpretation of Essun’s careful teaching really underlines the sacrifices Orogenes face in this world for the sake of absolute self-control, which is so crucial to their survival. It was somewhat distressing to see Nassun align with her father in the full knowledge that he had killed her little brother Uche for being an Orogene. in further very troubling company, Nassun then begins to associate with a character who makes a surprise from The Fifth Season, with a bit a new personality (woot, amnesia & mind-control!). I particularly enjoyed seeing Nassun’s opinion of the people around her and of her distant mother evolve throughout the book. As Nassun grows older and learns more about Orogeny, her father and the Fulcrum, she adjusts her view of the important players in her life in a way that gave me hope for her in the future. I’m not surprised that this wasn’t an easy read, nor I am saying it’s necessarily a bad thing. Not every book can or should be an easy or straightforward read, and this feels to me like it was written to be layered, subtle and wonderfully challenging. 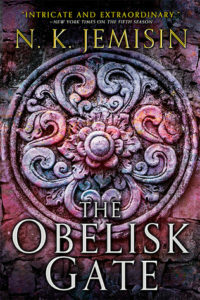 In The Obelisk Gate, Jemisin creates a fascinating and demanding story, whose depth and complexities are well worth taking the trouble to fully engage with. Ginger Stuyvesant is a medium for the British Army’s Spirit Corps during World War I. Each soldier heading for the front is conditioned to report to the mediums of the Spirit Corps when they die so the Corps can pass instant information about troop movements to military intelligence. While Ginger’s intelligence officer fiance, Captain Benjamin Harford, is away at the front, she discovers the presence of a traitor. Even worse, it is clear that the Spirit Corps is now being directly targeted by the German war effort. 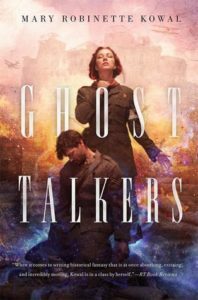 Ginger has to find out how the Germans are targeting the Spirit Corps and stop them. From the moment I first heard the premise of this book, I knew two things: the first was that I would probably cry my eyes out reading this (I did), and the second was that there was A Thing that was bound to happen. I won’t elaborate on what The Thing is, but it was always obvious that it just *had to happen*, the setup was too perfect for it not to. I expected The Thing to take place at the end of the book in the final moment of victory, to better punch the reader in the feels. Instead The Thing happened very early in the book, meaning that the aforementioned punching in the feels happens again and again all the way through. This was fantastic storytelling, but also very upsetting and bittersweet. I spend a lot of my time reading this book with my throat constricting and a bit of dust in my eye. I always love Kowal’s characters and this was no exception. I particularly loved Ginger for her resilience and strength of character, when her working day consists of sharing in the deaths of hundreds of soldiers in order to report on them to the British Army – not just viewing their deaths but actually living through their final moments and their fears in her own mind. She suffers so obviously from this on top of everything else, by the end I just wanted to give her a hug & make her a strong cup of tea. It took me a little longer to warm up to Ben because of some of the period-typical attitudes he exhibits: when we first meet him, he has just learnt that the Spirit Corps is in danger, and immediately tries to get Ginger out of danger. Of course, he loves her and wants to protect her, only the way he phrases it is that she somehow has less of a duty to the war effort than he does because she is a woman. Predictably I found this very very annoying – I do think it’s good writing, because it sounds like something a gentleman of that period would say, but it doesn’t mean I rolled my eyes at him any less. But Ginger quickly puts an end to that silly notion, and apart from this one little hiccup, Ben and Ginger’s engagement is always portrayed as a relationship between equals, who have real respect and love for each other. The book also has fantastic secondary characters, my favourite by far being Ginger’s Circle, a group of volunteers sensitive to the arcane, who support her during her shifts as a medium and keep her anchored to the real world. They are an extremely tight-knit group who all chose to come out to Northern France to help with the war effort, and go through so much together. You can’t help but admire their courage and loyalty and resilience. There are also several characters of colour, both in the ranks of the Spirit Corps and in the Army itself, which was great to see because it is historically accurate for World War I. Probably also historically accurate but quite a bit sadder is the way these characters are often mistrusted, summarily dismissed and generally given far too little credit for their work. All in all, I loved this book but I am giving it a slightly lower rating than I did the Glamourist Histories series. I got choked up and teary-eyes quite a few times reading this, and I found the reading experience a bit draining. I would definitely still recommend this book to people (so they can get punched in the feels like I was), I think it’s beautifully done but intentionally bittersweet. I mean, if you write a book about WWI and your readers end up feeling all light and happy and fluffy, you’re probably doing it wrong.